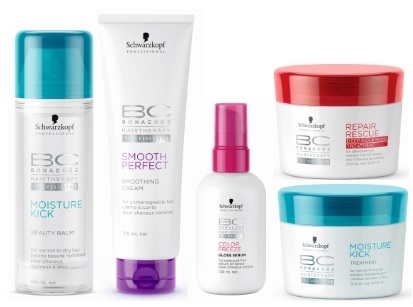 Schwarzkopf Professional relaunches BC Hairtherapy for ultimate hair perfection! Schwarzkopf Professional BC Hairtherapy was been improved and repackaged for product lines that bring hair as close to natural perfection as has ever seen before! The secret is their new Cell Perfector technology that works on perfecting both the hair surface and hair structure. In its natural, virgin state, hair has a lipid protection layer which consists of molecules with a chain of 21 carbons. External stress, chemical treatments or use of heat styling devices harm the hair surface, eroding that modecule chain. Until now, hair care technologies could only recreate chains of up to 12 molecules, but this new technology refills gaps in the hair's surface with chains of 18 carbons - bringing your hair closer than ever to natural perfection.Simultaneously, within each strand, the technology acts to rebuild the structure of the hair with hair-identical amino-acids chains to renew the hair with strength, elasticity and shine. There are 6 Hairtherapies to meet any hair need including: Moisture Kick - with hyaluronic acid derivate for normal to dry hair; Repair Rescue - with high concentration proteolipids for damaged hair; Color Freeze - with reactive silane for colour-treated and bleached hair; Smooth Perfect - with amino smoothener for unruly, coarse hair; Volume Boost - with silicone-free formulations for fine hair; and Time Restore - with Q10 and nutrifiller for mature hair. Moisture Kick Beauty Balm - 125ml - $17.75 - contains hyaluronic acid derivate to provide intensive rehydration and protection from heat damage to restore hair back to beautiful at a cellular level and adds a healthy looking shine. Smooth Perfect Smoothing Cream - 125ml - $17.75 - tames frizz for up to four days while deeply nourishing coarse and rebellious hair while offering optimum heat protection and makes hair easier to brush - brings hair under control, making if feel smooth with a healthy-looking shine. Color Freeze Gloss Serum - 100ml - $17.75 - reduces split ends, protects hair against breakage and adds a mirror-like shine. Repair Rescue Deep Nourishing Treatment - 200ml - $24.20 - provides in-depth nourishment and intensive repair even for extremely damaged hair, restoring natural strength at a cellular level. Moisture Kick Treatment - 200ml - $24.20 - a rinse-out emulsion that deeply rehydrates, softens and moisturizes hair at a cellular level. Available now at Schwarzkopf Professional Partner Salons - find one near you at: www.schwarzkopf-professional.ca.